In our previous column we discussed how the Racing Medication & Testing Consortium determines the regulatory thresholds for therapeutic drugs. We looked at this process because the National Horsemen’s Benevolent and Protective Association at its recent annual conference called for independent research to provide alternatives to RMTC-identified thresholds used by the National Uniform Medication Program. The HBPA is concerned several thresholds are too restrictive, resulting in an inequitable number of positives. 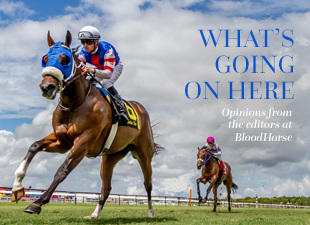 The North American Association of Racetrack Veterinarians backs the HBPA’s position and has begun spearheading research to produce alternative results it wants considered by the Association of Racing Commissioners International for its model rules. One problem, according to Fenger, was the 100 picograms per milliliter (plasma or serum) threshold for methylprednisolone, a corticosteroid sold as Depo-Medrol. The HBPA and NAARV don’t trust the RMTC’s methodology for threshold evaluation, which is called the 95/95 tolerance interval. In short, the 95/95 method achieves a 95% assurance that 95% of the samples will fall below an established threshold. The methodology was developed in Europe as a way to identify drug residue in food animals and suggested as an appropriate method to Dr. Rick Arthur by a veterinary toxicologist at the University of California-Davis. Arthur is a member of the RMTC's Scientific Advisory Committee and the medical director for the California Horse Racing Board. "That toxicologist assured us it was a valid and robust approach to determining thresholds," said Dr. Rick Sams, also a RMTC Scientific Advisory Committee member, who was involved in the methodology decision. "Dr. Arthur also approached a statistician at UC-Davis because he wanted an independent assessment and assurance because he had concerns." Fenger and others don't trust the methodology for several reasons. One, they feel it is being applied to studies using too few horses. Second, they feel the thresholds identified are so low that they invite false positives that could result from contamination. "We can't have thresholds so low that a horse can trigger its own positive by eating contaminated hay or bedding," said Fenger. Sams said the calculated thresholds generated by the 95/95 methodology are regularly and substantially higher than any of the observed values from the research. Still, the HBPA and NAARV want thresholds based on field studies using horses in a racing environment. According to Fenger, studies on Depo-Medrol, betamethasone, dexamethasone, and mepivicaine are being shepherded by a group called the Equine Health and Welfare Alliance. The exact membership of the Equine Health and Welfare Alliance is not clear. The group's website does not list individual members, but states it is supported by a "core membership of veterinarians who understand the importance of humane care of all animals." Fenger identifies herself as the EHWA's secretary and said one of its board members is Dr. Don Smith, who is also a member of NAARV. Fenger said the research is being conducted by practitioners around the country and on multiple breeds. Sams said having data from properly designed “real world” studies could be valuable, noting the research done by the RMTC has involved only one drug at a time and has not looked at potential drug-drug interactions. Drug interactions have been rarely identified in horses, according to Sams, but he added that some exist. But while field studies can provide good information, Sams also said they are challenging to manage. The industry will get a first glimpse of some EHWA field work results during the ARCI annual conference March 22-25 in New Orleans. Several truths have emerged since we’ve been wandering the medication briar patch over the last several weeks. One, the industry is poisoned by a lack of trust. The RMTC’s thresholds are criticized and considered suspect for being both too liberal and too conservative. Second, the funding available for research and testing is insufficient and heading in the wrong direction. In 2007 the RMTC had a $1 million budget and now operates with half that amount. A recent study re-evaluating a xylazine threshold cost $250,000 alone. Third, the industry wants and needs valid, enforceable thresholds because we know people in a highly competitive environment try to cheat. It’s why we need regulations, even on therapeutics. Most people truly put the horse first, but too many are injecting joints with corticosteroids as soon as a horse is entered in a race…as a matter of course, not a matter of treatment. That is not looking out for the horse. A high crossover likely exists between people unhappy with the RMTC’s work and those opposed to recent efforts to create a national medication testing and enforcement program through the United States Anti-Doping Agency. Many opposing the current method for establishing thresholds, however, are bolstering the argument for USADA’s involvement. USADA would provide greater independence between the industry and the regulations. A USADA program would have access to the best equipment, would continuously pursue better research, and would be adequately funded with support from all racing states. It’s time to drop the in-fighting and get behind a program that can work.